Having a far-flung destination wedding can be an appealing option for many reasons. For one, the stunning natural setting can help diffuse the stress of dealing with venue logistics, and for another, the venue itself is often likely to handle said logistics for you. Still, if you go this route, ensuring your guests get the luxe experience they deserve after they’ve flown a hefty distance, like, say, halfway around the world, can be a source of anxiety. And for eco-conscious brides- and grooms-to-be, finding a remote locale that let’s you say “I do” without leaving any impact on the pristine environment is no small feat. That’s where Indonesia’s Bawah Reserve comes in. Set on a once-uninhabited group of six islands in Indonesia’s Anambas Islands just north of Singapore, the luxury resort opened in January 2018 as the first property to bring tourists to this part of the South China Sea. The archipelago is so remote, in fact, that you have to fly to Singapore, take a ferry to Batam Island in Indonesia, then take an 80-minute seaplane ride just to get to Bawah Reserve, the only development land mass of the group of islands. 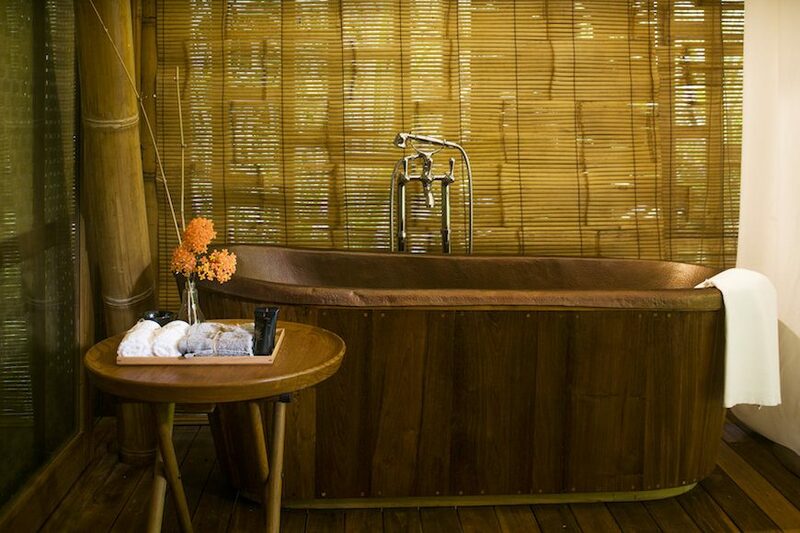 Since the resort opened, it’s focused on being the kind of honeymoon spot romantics dream of. 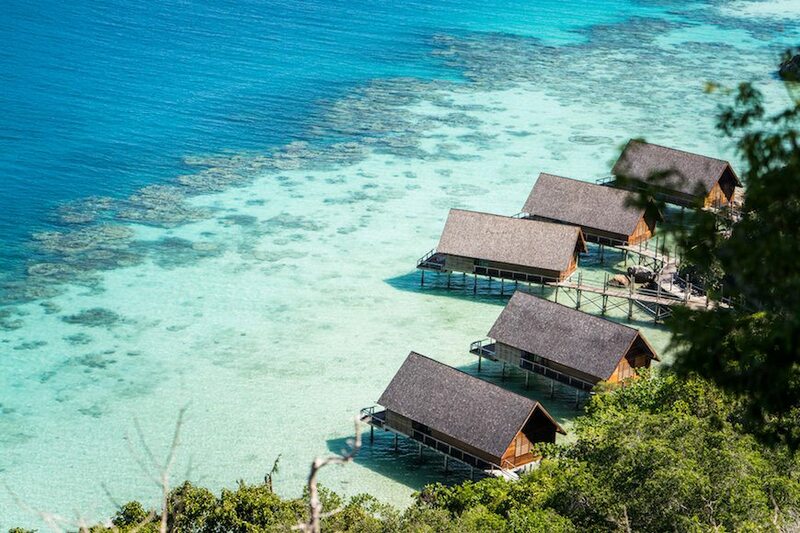 The bamboo and teak guest-room bungalows hover over water that fluctuates between glittery aquamarine and a deep, rich teal. And powdery, soft-white sand beaches dotted with palm trees rise into craggy cliffs in the distance. 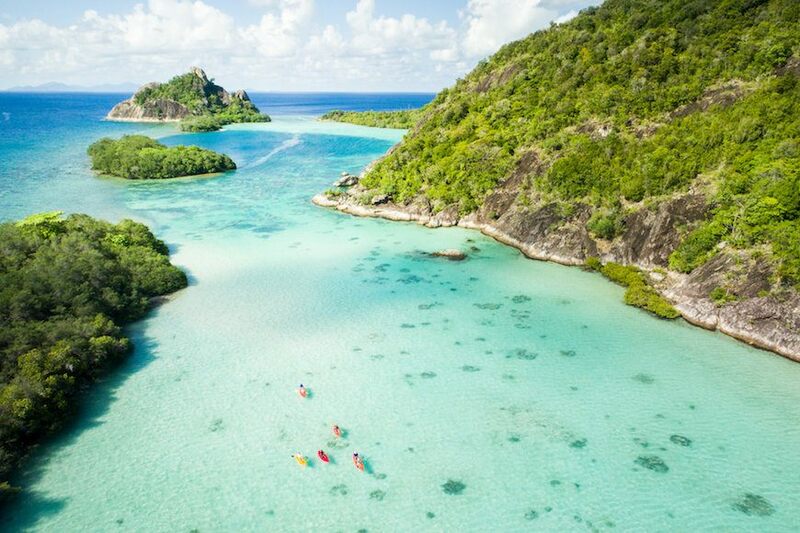 But starting this spring, betrothed duos won’t have to wait for the honeymoon to enjoy the natural bliss—the resort is building out a whole separate, adults-only island for private groups, making it the perfect tropical locale for an conscious destination wedding. In building out its second island, the resort is again focusing on the sustainable building process that brought the resort to life. The 35 existing villas, made from natural materials—and built by hand (yep, no heavy machinery in sight)—were created as to not disrupt nor destroy the natural landscape; the six new villas follow the same ethos. And they’ll likely be the end of expansion for Bawah. “We don’t want the island to suffer tourist trampling, so we have no plans to build on any other islands,” says Robinson. That focus on sustainability is really the appeal of the island. More than 250 islands make up the Anambas Islands, many of which are tinier and even more secluded than the six that make up Bawah Reserve. Because it’s so difficult for the government to provide those islands with basic services, like recycling, the hotel helps channel funds into the Bawah Anambas Foundation, which has started to implement a number of programs to tackle the archipelago’s main challenges, including access to resources, overfishing, and the local villagers’ reliability on the ocean, says Robinson. “Guests can get involved and see the conservation efforts firsthand—whether it’s a diving excursion to see the coral nursery, led by a resident marine biologist; or an educational evening class to learn about the surrounding flora and fauna; or the opportunity to adopt a coral by taking an active part in replanting,” he says. That’s another mark in Bawah’s favor as a wedding destination—once you’re there, you won’t have to spend a minute stressing over how to entertain your guests.